CARACAS, Venezuela President Hugo Chavez died of a massive heart attack after great suffering and inaudibly mouthed his desire to live, the head of Venezuela's presidential guard said late Wednesday. "He couldn't speak but he said it with his lips ... 'I don't want to die. Please don't let me die,' because he loved his country, he sacrificed himself for his country," Gen. Jose Ornella told The Associated Press. The general said he spent the last two years with Chavez, including his final moments, as Venezuela's president of 14 years battled an unspecified cancer in the pelvic region. Ornella spoke to the AP outside the military academy where Chavez's body lay in state. He said Chavez's cancer was very advanced when death came but gave no details. Ornella did not respond when asked if the cancer had spread to Chavez's lungs. The government announced on the eve of Chavez's death that he had suffered a severe new respiratory infection. It was the second such infection reported by officials after Chavez underwent his fourth cancer surgery in Cuba on Dec. 11. Venezuelan authorities have not said what kind of cancer Chavez had or specified exactly where tumors were removed. During the first lung infection, near the end of December, doctors implanted a tracheal tube to ease Chavez's breathing, but breathing insufficiency persisted and worsened, the government said. Ornella said Chavez had "the best" doctors from all over the world but that they never discussed the president's condition in front of him. The general said he didn't know precisely what kind of cancer afflicted Chavez, but added: "He suffered a lot." He said Chavez knew when he spoke to Venezuelans on Dec. 8, three days before his final surgery in Cuba, that "there was very little hope he would make it out of that operation." It was Chavez's fourth cancer surgery and previous interventions had been followed by chemotherapy and radiation. Ornella echoed the concern of Vice President Nicolas Maduro that some sort of foul play was involved in Chavez's cancer. "I think it will be 50 years before they declassify a document (that) I think (will show) the hand of the enemy is involved," he said. The general didn't identify who he was talking about, but Maduro suggested possible U.S. involvement on Tuesday. The U.S. State Department called the allegation absurd. Maduro, Chavez's self-anointed successor, said Chavez died Tuesday afternoon in a Caracas military hospital. The government said Chavez, 58, had been there since returning from Cuba on Feb. 18. 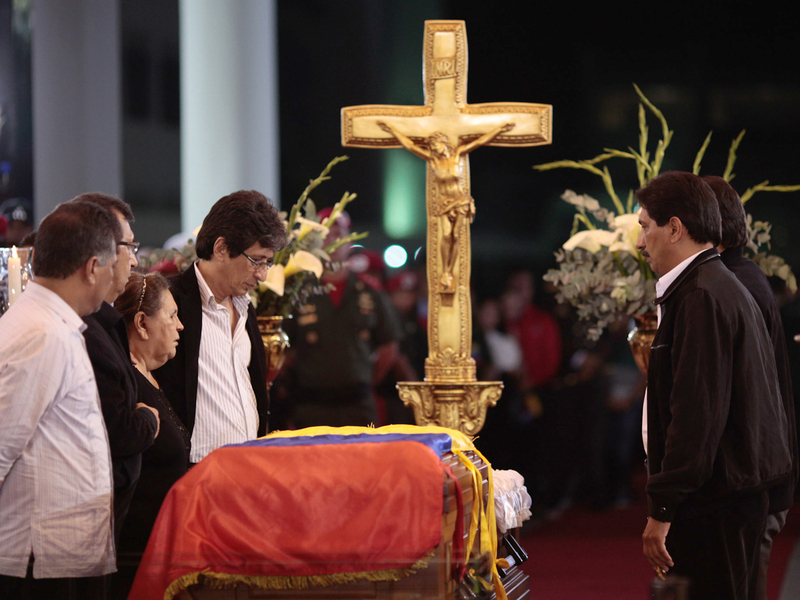 Chavez was carried back Wednesday to the military academy where he started his army career, his flag-draped coffin lying in state in the echoing halls until Friday's funeral. As a band played the hymn from his first battalion, a long ribbon of tearful mourners numbering in the hundreds of thousands bid farewell to the larger-than-life leader after a procession carried his casket through Caracas. With the entire government, including Maduro, caught up in the seven-hour procession, there were few answers to the most pressing question facing the country -- the timing of a presidential election that must be called within a month. Generations of Venezuelans, many dressed in the red of Chavez's socialist party, filled the capital's streets to remember the man who dominated their country for 14 years before succumbing to cancer Tuesday afternoon. Chavez's coffin made its way through the crowds atop an open hearse on a five-mile journey that wound through the city's north and southeast, into many of the poorer neighborhoods where Chavez drew his political strength. At the academy, Chavez's family and close advisers, as well as the presidents of Argentina, Bolivia and Uruguay, attended a funeral Mass around the president's glass-topped casket. The public then began filing past to peer at their longtime president, many of them coming closer to him than they had ever been while he was alive. Some placed their hand over their heart, others saluting or raising a fist in solidarity. The viewing lasted far into the night. Set against the outpouring of grief was near-total official silence on where Venezuela is heading next, including when the election will take place. Even the exact time and place of Chavez's funeral Friday has not been announced, nor has it been revealed where he will be laid to rest. Opponents already have been stepping up criticism of the government's questionable moves after Chavez's death, including naming Maduro, the vice president, as interim president in apparent violation of the constitution, and the military's eagerness to choose political sides. For a day, at least, Chavez's heartbroken supporters immersed themselves in emotion and sad farewells. Maduro and Bolivian President Evo Morales, one of Chavez's staunchest allies, mingled with the crowd, and at one point both fell to the ground in the jostle of bodies pushing in every direction. Military officers and Cabinet members ringed the president's coffin, stone-faced. Other mourners pumped their fists and held aloft images of the late president, amid countless yellow, blue and red Venezuelan flags. "The fight goes on! Chavez lives!" the mourners shouted in unison, many through eyes red from crying for long hours. Chavez's mother, Elena Frias de Chavez, leaned against her son's casket, while a priest read a prayer before the procession left the military hospital where Chavez died at age 58. People who passed by the glass-topped coffin said Chavez's body was clad in the presidential sash and the military uniform and red beret of his days as a paratrooper. Ricardo Tria, a social worker, said he waited nearly four hours to pass by the casket. Chavez looked "asleep, quiet, serious," he said. "I feel so much pain. So much pain," said Yamile Gil, a 38-year-old housewife. "We never wanted to see our president like this. We will always love him." Others who bitterly opposed Chavez's take-no-prisoners brand of socialism said they were sorry about his death, but hopeful it would usher in a less confrontational, more business-friendly era in this major oil-producing country. "I am not happy that he has died, but I can't be sad either," said Delia Ramirez, a 32-year-old accountant who stayed away from the procession. "This man sowed hatred and division among Venezuelans." The 1999 constitution that Chavez himself pushed through mandates that an election be called within 30 days to replace a president, but Chavez's top lieutenants have not always followed the law. The charter clearly states that the speaker of the National Assembly, in this case Diosdado Cabello, should become interim president if a head of state is forced to leave office within three years of his election. Chavez was re-elected only in October. But Chavez anointed Maduro for that role, and the vice president has assumed the mantle even as the government has named him as the ruling socialist party's candidate in the presidential vote. The military also appears to be showing firm support for Maduro despite a constitutional mandate that it play no role in politics. In a tweet late Tuesday, state television said the defense minister, Adm. Diego Molero, had pledged military support for Maduro's candidacy against likely opposition candidate Henrique Capriles, raising concern among critics about the fairness of the vote. Capriles, the 40-year-old governor of Miranda state who lost to Chavez in October, was conciliatory in a televised address after the president's death. "This is not the moment to highlight what separates us," Capriles said. "This is not the hour for differences; it is the hour for union, it is the hour for peace." Other opposition leaders were more critical of the military stance. "When all Venezuela wants unity and peace, and a climate of respect between Venezuelans predominates, they're contrasted by what's unacceptable, the declarations of the minister of defense, that are, besides false, unconstitutional," said Ramon Guillermo Aveledo, executive secretary of the opposition coalition. Cynthia Arnson, director of the Latin American Program at the Washington-based Woodrow Wilson International Center for Scholars, said Maduro won't be able to harness "Chavismo" as Chavez did so successfully, but she expects him to win any upcoming presidential vote. "There's really no one who can step into those shoes," she said. Maduro's Jekyll-and-Hyde-like behavior Tuesday has stoked worries about a future government. He used a speech just before Chavez's death to lash out at the United States and internal opponents he accused of plotting to destabilize the government. He pointed to shadowy forces as being behind the president's cancer and expelled two American military attaches he charged with spying. Then, in a televised appearance to announce the death, a shaken and somber Maduro called for peace, love and reconciliation among all Venezuelans. Venezuela and the United States have a complicated relationship, with Chavez's enemy to the north remaining the top buyer of Venezuelan oil. But Chavez's inner-circle has long claimed the United States was behind a failed 2002 attempt to overthrow him, and he has frequently used anti-American rhetoric to stir up support. Venezuela has been without a U.S. ambassador since July 2010 and expelled a U.S. military officer in 2006. In Washington, senior Obama administration officials said Wednesday they hoped to rebuild the U.S.-Venezuelan relationship, but acknowledged that a quick rapprochement was unlikely given the Latin American country's impending presidential election. The officials, who spoke on condition of anonymity because they weren't authorized to speak publicly on the matter, expressed displeasure with the expulsion of the two U.S. military officials by Venezuela and Maduro's accusations that the U.S. was somehow responsible for Chavez's cancer. "Yesterday's first press conference was not encouraging," a senior official said. "It disappointed us."